The Ho Chi Minh City People’s Court last December pronounced a judgment, completing the first-instance trial of a civil case between local taxi firm Vinasun and Singapore-based ride-hailing app Grab. However, it does not end the controversial story but raises a lot of questions about how to change authorities’ management thinking to adapt to new business models emerging in a sharing economy. The lawsuit began more than one year ago in late 2017 with Vinasun filing a petition with the municipal court, accusing Grab of committing unfair competition practices and claiming a compensation of VND 40 billion (approximately USD 1.7 million), equaling its loss in 2016 and 2017. To understand the case, let’s look back to 2014 when Grab launched its operation in Vietnam and quickly became a redoubtable rival of conventional taxi operators. In January 2016, the Ministry of Transport issued Decision 24 on the pilot application of science and technology to support transport management and connection on a contractual basis. Under the Decision, ride-hailing apps like Grab are identified as science and technology application service providers and, therefore, are not bound to any regulations applicable to transport service businesses such as peak hour taxi ban on certain roads in Hanoi and Ho Chi Minh City. It was such mechanism that caused inequality and sparked disputes between traditional taxi firms and their software-based counterparts. In its petition, Vinasun alleged that Grab had exploited legal loopholes to offer “rampant” promotion deals and discounts. The company also claimed that it had to comply with a dozen of regulations, while Grab needed to follow only three, leading to unfair competition. “Industry 4.0 apps are an inevitable trend. However, being just an app-based ride hailing service provider, Grab has disrupted the taxi transport sector, causing several implications to state management activities in collection of tax as well as guarantee of social security for those working for Grab,” Truong Dinh Quy, deputy general director of Vinasun, was quoted by the Viet Nam News daily as saying. Grab, in its turn, contended that Vinasun’s allegations were baseless and that their software solution has actually created fair grounds for competition between conventional taxi companies. 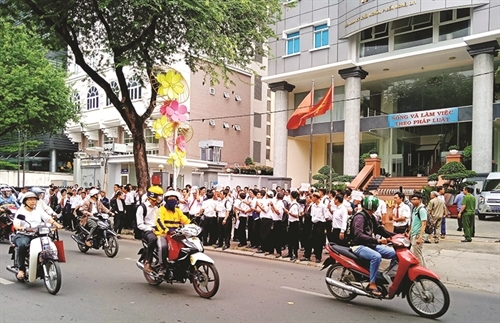 In late 2018, after several delays, the Ho Chi Minh City People’s Court issued a verdict forcing Grab to pay a compensation of VND 4.8 billion (approximately USD 207,000) to Vinasun. Sharing this view, Nguyen Van Hau, chairman of the Ho Chi Minh City Bar Association, warned of the long-term effects of this potential bad precedent. “New business models are bound to arrive in Vietnam in anticipation of the Comprehensive and Progressive Agreement for Trans-Pacific Partnership (CPTPP), and local firms might use the case to hinder newcomers and deter foreign investors,” he said, emphasizing that every effort should be made to ensure a fair and equitable business environment. It is undeniable that the sharing economy is changing the way of conducting business all around the world. In Vietnam, new business models, particularly platform-based ones like Grab, are blowing winds of change throughout the local market, promoting competition and bringing more benefits to customers. However, state authorities are seemingly at a standstill in finding out a mechanism for managing these new business models. In the field of transport, car passenger transportation services are now classified into five types, each is subject to separate business conditions. Grab, on the one hand, joins the road transport market but, on the other hand, possesses features distinct from all existing transport services. State management agencies, therefore, have two options: Either arranging this new business model into one of the five existing transport services and requiring it to comply with relevant business conditions or identifying it as a new business model and designing a new management mechanism for it. However, although two years have passed since the Ministry of Transport permitted the trial operation of ride-hailing apps in Vietnam, the ministry still fails to make the final decision. Reality shows that it is not an easy choice. During the process of drafting a decree to replace Decree 86 of 2014 on conditions for provision of road passenger transport services, the Ministry of Transport has once and again changed its viewpoint about this matter. Some versions of the draft decree identify ride-hailing app operators as enterprises providing software solutions connecting transport business with customers, others regard them as businesses providing transport services under electronic contracts. In the latest version, all companies operating in passenger transportation with under nine-seat cars using ride-hailing apps are proposed to be put in the same bracket as traditional taxi firms. In a report titled “The legal flow 2018”, the Vietnam Chamber of Commerce and Industry comments that embarrassment possibly rises from the fact that state agencies’ decision might be affected by too many marginal factors such as the traditional taxi industry’s reactions, aspirations and interests. Hence, if bypassing all sideline stories and weighing only elements concerning public interests, e.g., traffic safety, public order and customer benefits, what is a tech-based ride-hailing service and how should it be managed? By nature, tech-based ride-hailing service is a form of brokerage services with software solution firms acting as brokers/intermediaries connecting drivers and customers. However, unlike ordinary brokerage services, app-based ride-hailing service may involve a huge number of subjects. i.e., the group of persons with related interests might be large enough to be considered public interests. At the same time, the service is provided in the transport sector, which is a conditional business. Therefore, from the viewpoint of public interests, there must be control measures to minimize any possible negative impacts on relevant stakeholders. For example, in order to ensure passengers’ interests, enterprises providing app-based transport brokerage service must ensure that their driver partners satisfy all law-prescribed conditions applicable to transport service providers; in case of disputes between drivers and customers, brokerage businesses should act as the representative of driver partners to pay compensation to customers first and claim the paid damages from the drivers at fault later. On the other hand, tech-based brokerage service providers would be required to perform several obligations toward their driver partners. It is worth noting that the transport law is not the sole tool for protection of drivers’ interests. It is absolutely possible to apply the competition law to govern operations of app-based brokerage service providers in case they abuse the monopolistic or dominant position to impose unreasonable terms and conditions on driver partners, thus damaging the latter’s interests. As for the State, it is necessary to devise a new tax policy suitable to the nature of the new business model. Nevertheless, for the time being, state agencies still appear to ignore the possibility of identifying the business model of building connections like Grab as a form of brokerage/intermediation but try to “shape” it in the framework of one or several existing business models.